First off I am going to update you on the status of flowers from previous posts. Remember the old college futon repurpose? The futon arms were spray painted a light gray. The impatiens have filled in nicely. 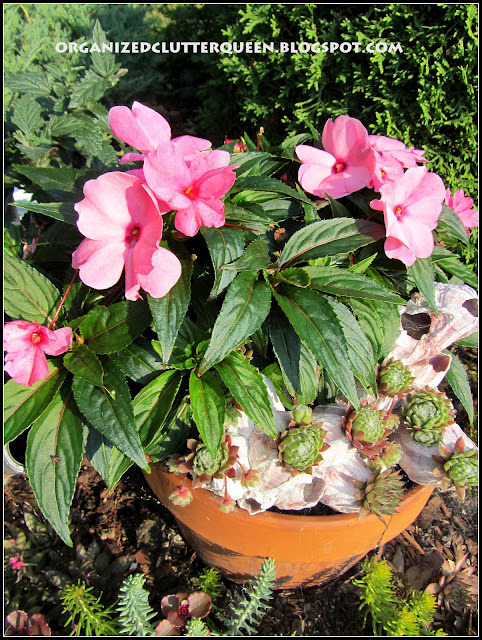 The New Guinea impatiens continues to bloom with barnacles and hen and chicks! 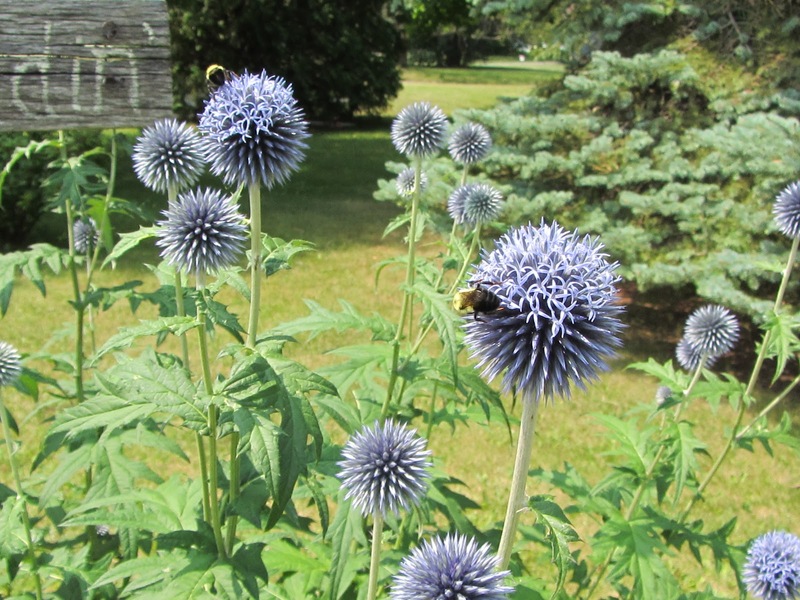 Bees are buzzing around the newly opened Globe Thistle. My four piece sprinkler collection sits in a bed under my bay window in the front of the house. The bed is mostly hostas, Solomon's Seal, and Lady's Mantle. (Bleeding Heart did not make it through the winter). My kid's used to actually use this one because the water spray was really fun! A galvanized tub of double, single and variegated red impatiens sits with the sprinklers. I don't run across cheap sprinklers much, so it's a slow growing collection. I also am partial to red ones. I see them at estate sales mostly. I won't pay much for them because they stay outside all summer exposed to the elements. I so enjoy flowers and flower gardening! Wow! So happy to find your blog! Your photos are gorgeous and I love your ideas! Awesome! 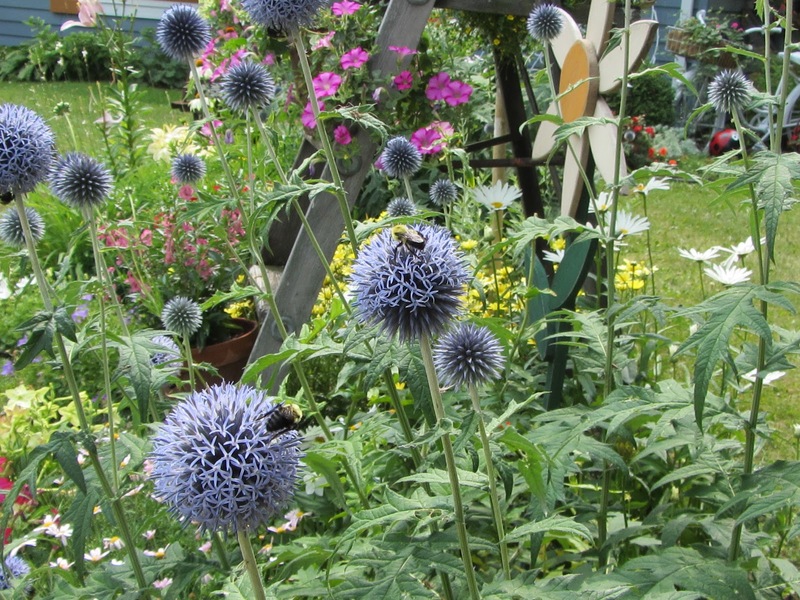 I love the globe thistle! Can't say I've ever seen those before. Everything looks beautiful, Carlene! 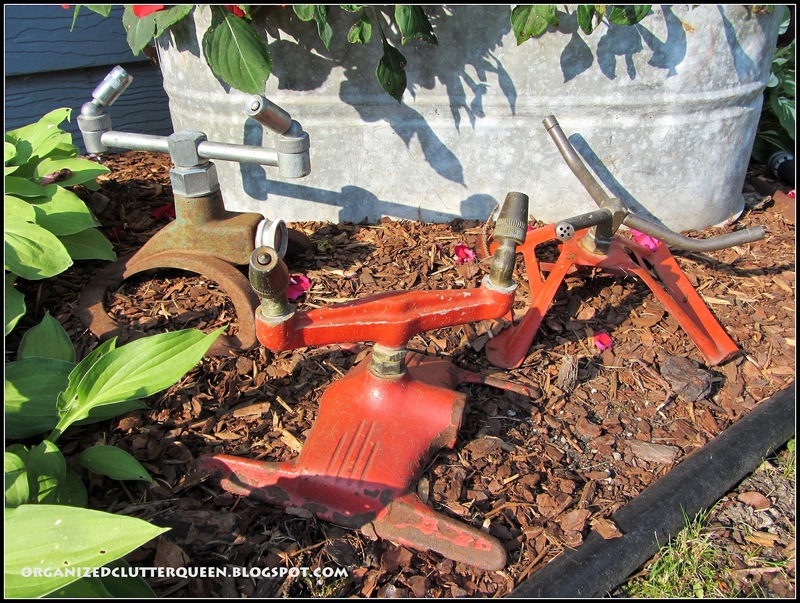 Carlene,How cool to collect old water sprinklers, I don't think I've known anyone that has. 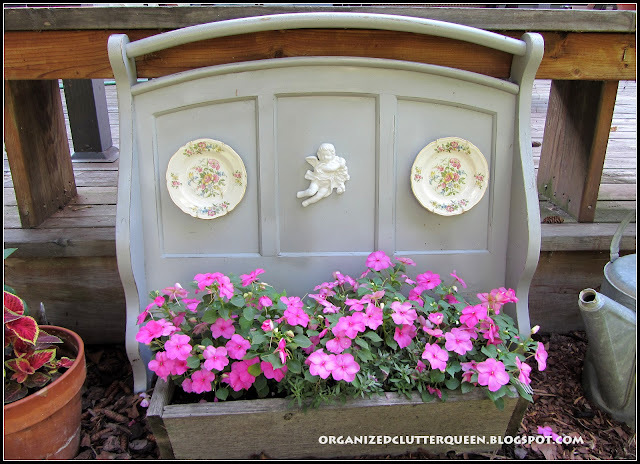 I love how you repurpose things.I do love flowers and enjoy gardening also. Love your sprinkler collection....I have a couple of old hose nozzles but no sprinklers....I have a feeling they are not real popular in Arizona! I love the containers you have created. I love the New Guinea Impatiens and that red coleus. Very pretty. You have some very creative and fun garden ideas. I must say that that galvanized tub is my favorite! 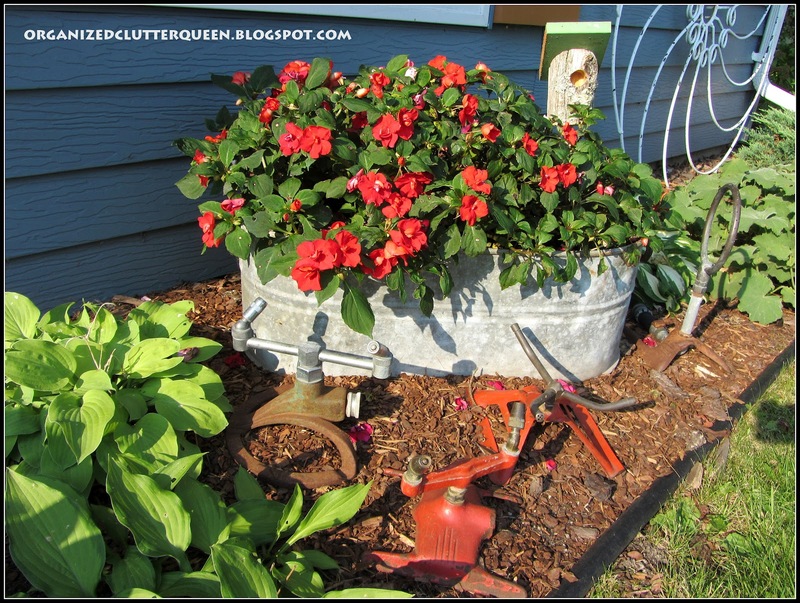 So pretty filled with bright red impatiens Did you drill holes in the bottom of the tub. Thanks for sharing your garden filled with wonderful inspiration with us at TUTORIALS TIPS AND TIDBITS! I just noticed the globe thistle photos were missing and had to re-add them! Does that ever happen to you on blogger? I love your collection! Your flowers are beautiful. Love your sprinkler collection! Lovely plants! The sprinklers are a cool collection. I've often had them in my hands at estate sales, and I have no idea why I've never bought a single one! Love your collection of sprinklers too! We have a few and we still use them also! 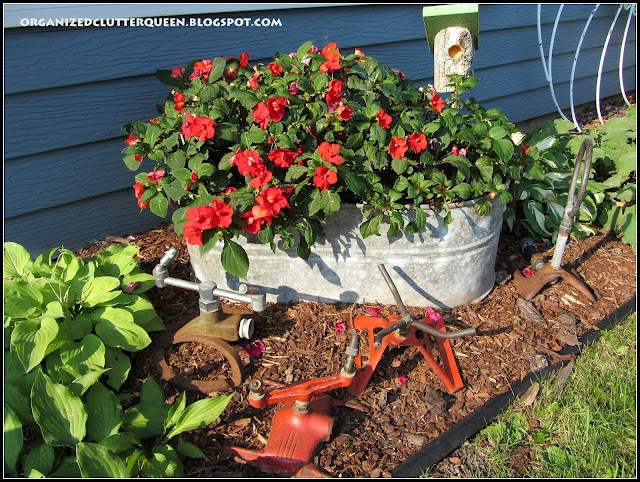 From futons to sprinklers, what a lovely post, Carlene! Thank you for sharing it at Potpourri Friday at 2805! 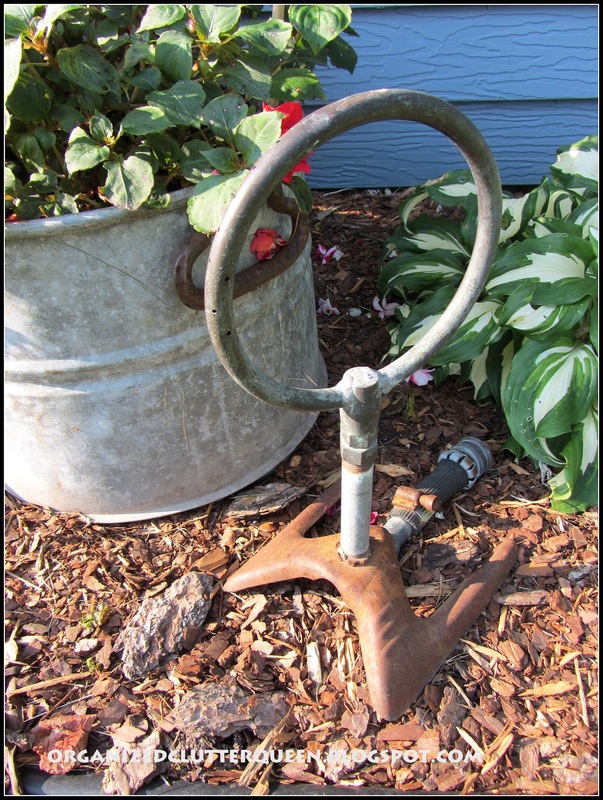 I mean need a vintage sprinkler collection! I am pinning this to my cool collections board - and I'll be searching high and low! I must say you had the nicest college futon I've ever seen! I love the way you repurposed it. It looks amazing as yard art, so very creative with the angel and plates. Your collection of sprinklers is great to, I wish I could find some around here. Great post! Carlene, my kindred friend loved seeing your sprinkler collection. I have four large ones also. One of mine is similar to yours but not one is alike. who knew there were so many differnt styles of sprinklers out there. My latest orange one I bought in Oregon. I paid $20 for it. That is more than what I have paid for the others but I loved the cheery color. I only have one red and it's medium size. Most of mine are green. Love all of yours and your flowers are all looking fab. Thanks for sharing with Share Your Cup. I love your sprinkler collection! The futon ends look fabulous too! I love the Globe Thistles! 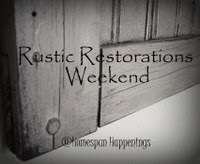 Thank you so much for linking this up to Rustic Restorations Weekend! Your love for your garden really shows. Those globe thistles are amazing. God's works are wonderous! I'm loving your sprinkler collection. They remind me of the ones I grew up with. So much better than the cheap ones of today that break so fast. Thanks for sharing them with us, Carlene! Carlene--What a beautiful garden you have--I love the futon repurpose and the vintage garden sprinklers--fantastic! 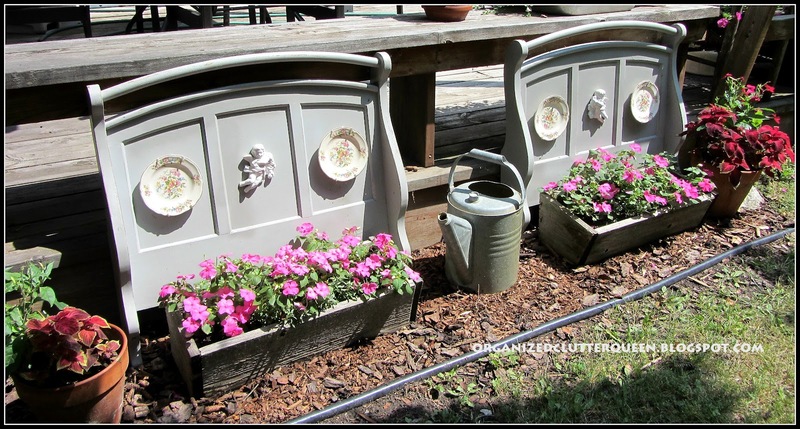 Hello Carlene, Your repurposed Futon arms are absolutely wonderful! 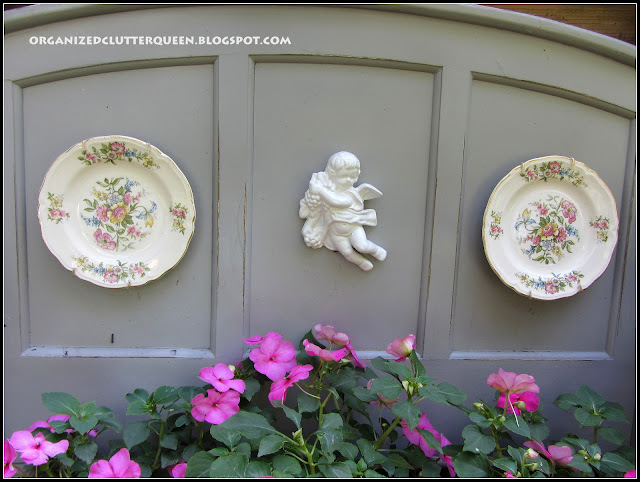 I love the addition of the plates and the cherubs! Your collection of old sprinklers is wonderful and whimsical! 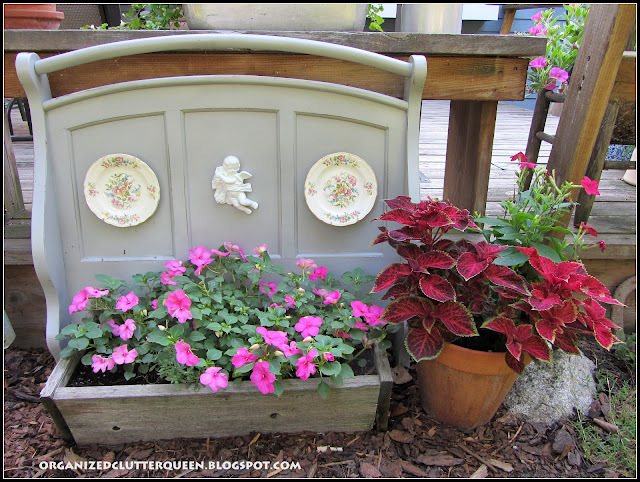 I loved visiting your garden and appreciate you sharing with Home and Garden Thursday - your post will be featured in this evening's post! Your globe thistle are wonderful. They add such an interesting touch to the garden. Love your sprinkler collection, but I know what you mean about how expensive they can be. I see them at estate sales for some really unreasonable prices.